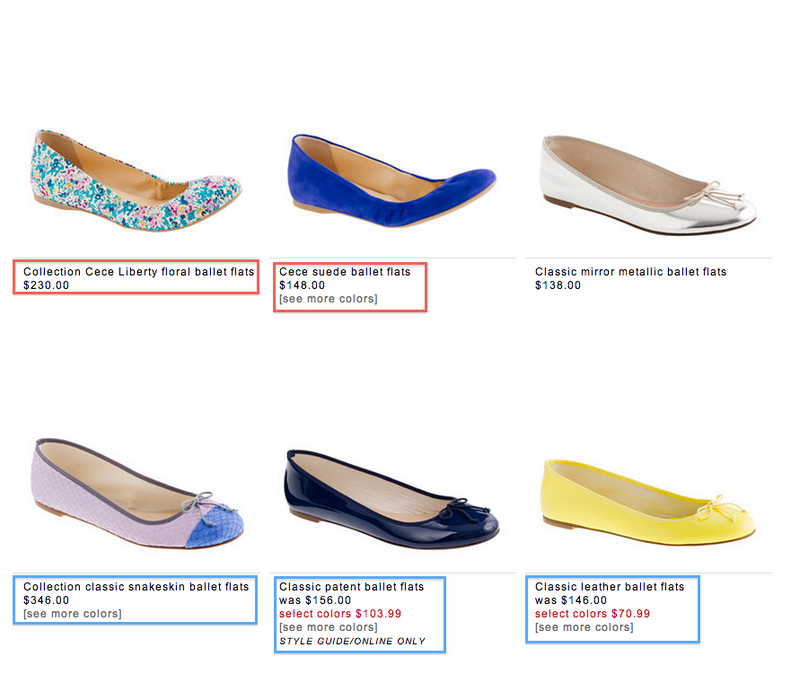 What are “anchor” pricing cues, and how does it affect the way I shop and price things? | Save. Spend. Splurge. Home › Money › Discussions › What are “anchor” pricing cues, and how does it affect the way I shop and price things? What are “anchor” pricing cues, and how does it affect the way I shop and price things? “Anchors” as a pricing cue is a concept taken from one of THE BEST books I’ve read: Priceless: The Myth of Fair Value (and How to Take Advantage of It), and the idea of pricing cues I think would be interesting for everyone to learn about. “In the luxury trade, [anchor] describes an obscenely high-priced article displayed mainly to manipulate consumers. The anchor is for sale – but it’s okay if no one buys it. The beginning sentences of Chapter 26 of Priceless: The Myth of Fair Value (and How to Take Advantage of It, an excellent book! We keep these prices in our head of what we think it’s worth, but we aren’t actually evaluating anything on its basis of worth — we’re doing it based on anchor pricing cues that are given to us. We think someone is buying it (or else why would it be on display?). J. Crew is the King of anchor pricing cues. They are so good, even I get suckered in sometimes. They’ll put something that is insanely expensive, beside something comparable but for way less money. 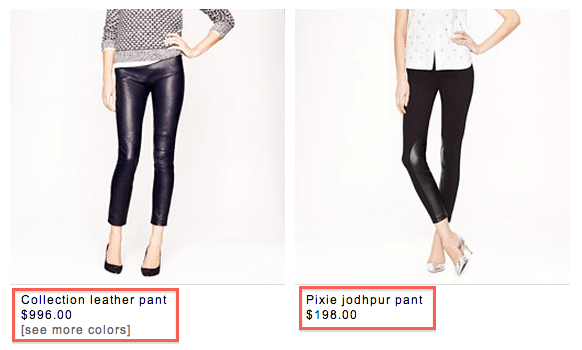 See how the leather pants are almost $1000, but the SIMILAR-looking pants are a steal at $198? At 1/5th of the price, you can buy those Pixie jodhpur pants and feel like you’re wearing the quality and style of the $1000 ones. Notice how since we read from left to right, the most expensive pair of shoes is on the left, then the mid-priced, and then cheapest ones (on sale for $71 no less!)? They don’t expect you to REALLY shell out $1000 for a pair of leather pants, or $345 for a pair of “snakeskin ballet flats”, but all that does, is make you see the rest of their goods on sale as being a great bargain. Frankly, if I’m paying $345 for a pair of snakeskin ballet flats, I’d rather buy Repetto ballet flats made in Paris, which fit and feel like a dream on my feet (I tried on a pair once). A stock that is worth a penny to start, will most likely not reach a price of hundreds of dollars. If you price something cheaply, people will instinctively want to stay anchored around that benchmark that has been set in their head. They can go up to let’s say 50% more or less than the benchmark, but they’ll stay within that range. Something that costs a penny, won’t go beyond maybe $20 in our head (not even, maybe), but something that starts out at $25, wouldn’t drop down to $0.01 (unless they’re really tanking). With those above examples, it means that now we think of ballet flats in terms of $50 increments, but penny stocks in $0.10 increments. We think of everything relative to what the base price was. Something that was originally $500, marked down to $350, makes us feel like it’s a deal, even though we’d really only pay $350 at retail, based on its worth to us and our life. If something was priced at $500, and then marked down with just $10 off, no one would think it was a deal. A stock priced at $50, dropping $10 in value however, may trigger people to purchase it, thinking it’s a deal. Everything is also relative to what the anchor pricing cue we were given. I am the Queen of paying the price for something. Buy it once, lest you end up buying it twice and creating more waste, I say. What I am saying, is be careful when you’re shopping whether or not your anchor pricing cues are anchored in your head based on what is on the tag. Try your best to objectively evaluate what you are buying is worth to you, and then price it from there. Just take a look around the next time you shop, and keep in mind ” anchor pricing cues”. I never thought of the JCrew Collection pieces that way. From what I understand there is a different place of origin and fabrication. I guess the question is does anyone buy it. I was interested in the trench in all honesty because of the fabrication used. The Collection is a fairly new concept by JCrew when they began to become more fashion forward. I’ve always thought of anchoring more in terms of bundles or markdowns. Like with cable/phone, etc, the sweet spot for the business is the middle of their bundle range. Or for stores that always seem to be giving a % off when in reality their prices are too high to begin with (there’s a local vintage dealer here that constantly offers 50% off which is not a deal by any means if you see his fictitious “full price” stickers). When I worked in luxury retail, we did put up items on visual display that we might not sell as much as it was higher priced due to materials or contruction of the piece than our average price point. Part of the reason we displayed these items is it conveyed the look of the season’s collection (theme/feel/concept) and the brand image of the shop (it made the shop look nicer). For example, we may sell black shoes the most but you don’t want a shop filled with displays of black shoes (it’s quite boring) so you have some fanciful materials, etc displayed as well even though you may only sell a few of say the pink feathered styles versus the basic everyday style. I love reading retail business and consumer non-fiction books so I’m logging this one down on my list, thanks! It is one of the best books I’ve read in 2013, and I said that in the month of January 🙂 I learned SO MUCH. I always found it a bit strange that J. Crew Collection would be so expensive compared to their (already) expensive fare, but it made so much more sense after reading the book. I know there’s a big difference between J. Crew and J. Crew Factory, they seem to produce completely different clothes / lines for each, so it isn’t like J. Crew clothes that don’t sell, make their way to J. Crew Factory. I think anchoring as you have described it, applies as well. I’m sure that it is also to give a luxe factor, and the “look” for the collection, but masterminds are behind all of this to get us to buy things. They also did a study that people tend to always choose the mid-priced item. They don’t buy the most expensive or the cheapest, but somewhere in between, which is why you may sometimes see an anchored price way up in the thousands and then something REALLY cheap, so that people buy in the middle thinking that they’re getting “quality” for a better price. Interesting post, this is the first time I’ve heard about anchoring. Maybe I have simple taste, but I think the “cheaper” options in both shoes example look better, anyway (and I love snakeskin). Thanks for the informative post! That’s one thing I like about Tesla Motors. They are using something similiar to an anchor in their long term marketing strategy. (I also love the technology they are producing). If you look at it you’ll see what I mean. First the Tesla Roadster, about 120k, after a few years, the Tesla S sedan, which can be had for 50-60k. In a few more years, there will be a Tesla econobox for the mid 20’s. The Anchors are the more expensive cars, you too can have a TESLA for mid 20’s. That’s my prediction for what will happen. Mercedes did the same thing. They used to only have the very expensive cars, and people thought that if they made cheaper Mercedes cars, they’d dilute the luxurious name. In the end, those C class cars are the ones that sell the most, because it’s a cheap(er) but luxurious car, even if they can’t get the S class.